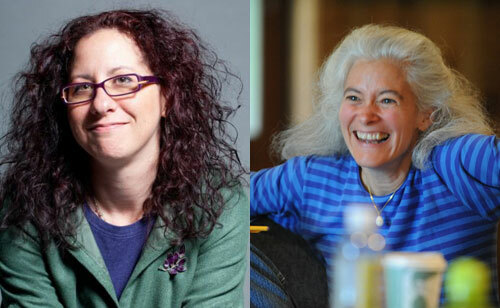 This month’s Q&A is with Elise Thoron and Julie Felise Dubiner, the playwright and dramaturg who worked on the translation of The Merchant of Venice. Q: Can you describe your process for translating The Merchant of Venice? Elise Thoron: The first stage was reading the play a few times for my pure enjoyment and following the filaments of notes on language and history I often do not have time to really track down. Then, mulling, daydreaming, imagining the play in my own mind, thinking about characters’ levels of speech, and reading some criticism about the play, but not too much. I also started listening to different film versions of the play to hear the language spoken, and saw whatever live productions came my way. As with painting a house, translation is as much in the preparation as it is in the actual laying on of paint. I wanted to be familiar with the play, know its ins and outs, have lived inside it in different ways, and for it to have lived in me for some time before even attempting a word. Then, in order to start I had to get over the huge hurdle of not wanting to alter a word of Shakespeare’s poetry. I was even contemplating giving up the commission, but Julie encouraged me to try. I went to the library and took out translations of the play in other languages: Russian, French, German, Italian, and started to peruse them. This was extremely helpful in getting over my resistance to altering Shakespeare’s text, and it gave me some kindred spirits who were changing up Shakespeare with a clear goal of making it accessible to audiences in another language. The most useful translation and my real companion through the process turned out to be a 60s French translation of Merchant of Venice in one of their excellent paperback editions of the classics. With that in hand to jog my mind free of the original words, I got going by sketching and noodling around with Antonio’s first speech and the difficult scene that follows for days, trying to get a feel for how little intervention is possible. Soon on I decided the iambic pentameter was essential to the play, that it provided the breath that kept us moving through this difficult material. So keeping the meter and rhyme and alternating with prose passages became a given for translation. I also decided that different characters would have different levels of intervention: Shylock the least, his original Shakespearean speech giving him dignity and voice of an archaic character (he’s also very well written) and at the other end of the spectrum, motor mouth Gratiano feels the most modern and has a lot more intervention. Then there was nothing left but to get down to the nitty gritty of the work itself. I had the folio text on the left side of the page and started filling in the blank right column, line by line, scene by scene, act by act. I did most of it occupying the big sofa in the living room of a family house with various people coming in and out, my reading lines aloud, their commenting, catching snatches of conversation as they passed through, or sat around and talking. So the translating was done amid the lively flow of conversation and laughter, not in silence or isolation. I’ve always felt translations for stage benefit from speaking them aloud, and being part of an ongoing dialogue. Of course, there is at some point some very necessary time alone to hear characters’ individual voices and the unified “voice” of the translation, but if you’ve done your prep work well the more “mechanical” work of translation is never “mechanical” if kept boisterous with people around. When I got through a first pass of translating the whole text, Lue and Julie had great notes that were fun to implement; so helpful to have very sharp readers who know way more than I do about Shakespeare. Then it was thrilling to all gather and hear it read aloud at a pick up reading in NYC. Only two things I wanted: a diverse cast and a wide range of experience with Shakespeare, which we had: from a British pro who had played many of the leads, to a spoken word poet and MC who had never encountered the Bard. I wanted to see if you could just pick up and read the new translation and what that would be like for different performers. When we did a workshop reading at LOCAL Theater in Boulder as part of a new plays lab we had some rehearsal and an audience. I was happy that the talk back was fierce and focused on the play itself rather than the translation. Although, one audience member said he had to work much harder now that he knew what was being said, rather than just listening to the nice-sounding poetry. And one felt the play was more devastating and relevant for understanding in real time what characters are saying. 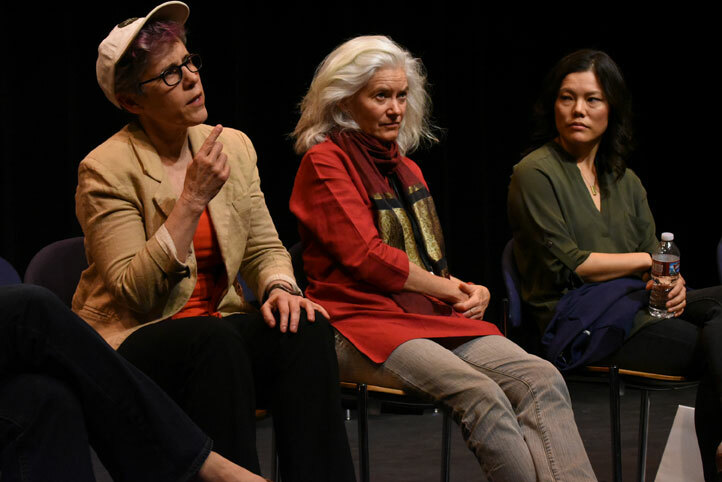 (left-right) Lue Douthit, Elise Thoron, and Desiree Mee Jung in Boulder, Colorado, during a talkback after a staged reading of The Merchant of Venice. Any process of translation ends up by putting the text through an ever finer sieve of scrutiny word by word. Hearing the play aloud and an audience’s reaction to it is incredibly useful to knowing how effective the language interventions have been. I’ll keep working on Merchant. The next big task is when someone decides to do a production of the translation. Then the real question of translation – context — comes into play. For whom are you translating? Why? And this goes hand in hand with dramaturgical and directorial decisions. What Play on! so wisely asked for was a first layer of translation of the whole play, every line, no editorial decisions or adaptations, just a focus on bringing the language to a contemporary ear. It is such a joy to hear the plays read in their entirety in these translations; so often in production scenes are cut and there is vast editing of the material that no one can understand now. So to hear the plays intact is a gift – the Merchant translation read only two hours and fifteen minutes uncut. Often one does not have to do much to alter the original text for better modern comprehension: Make sure the action of the speech is intelligible and let the engine of the poetry roll forth unaltered. Q: What has been one of the most challenging aspects of translating The Merchant of Venice? Elise Thoron: Preserving the iambic pentameter, while clarifying and untangling meaning to a modern ear. Shakespeare seemed to sacrifice most everything to keep meter in Merchant. With my assignment I had to keep more of an eye on meaning while still making the poetry breath and sing, this was really hard. Q: This was a deep dive into Shakespeare’s text. How do you think it’s affected you as a playwright? Elise Thoron: I am not sure yet. A while back I was working on writing a play The Thief of Venice about 16C Venetian poet and courtesan Veronica Franco, who defended herself successfully in a heresy trial. One of the reasons I was interested in the commission was to spend more time in Shakespeare’s world of The Merchant of Venice, then return to the play I’d never finished. This summer when I take up Thief again I’ll be fascinated to see how Merchant informs my writing. In more general terms, after working inside of a Shakespeare play, I feel even more emboldened to create complex worlds with numerous characters, use theatrical conventions more brazenly, and not feel like everything has to add up too neatly. I like to tackle big historical sweeps and subjects in a theatrical way; I have more tools to work with now. I’d like to say I will “attempt more poetry” – I may try, but I honestly think real poetic language is a gift few writers have and to be greatly treasured in ones that do. It is not necessary to be a poet to write good plays, but when you encounter real poetic language on stage full force like Shakespeare (or in my adapting/directing work Baldwin, Zora Neale Hurston, Lemon Andersen, Junot Diaz) it’s fabulous. Q: What did you learn about The Merchant of Venice through the translation process? Do you see it differently now? Elise Thoron: Yes, I see it differently now. I realize it is even more brutal and strange a play than I thought. Brilliant because the sum of its parts never quite add up; it is devious, shifting, irrational, slippery, and as inexplicable as the subject at its core that drives it: prejudice. Julie Felise Dubiner: I went into the play knowing at this moment in my life in this country and the world that the anti-Semitism written into the play was going to be hard for me simply to be intellectual about. It was indeed harder than I thought. Elise’s translation surfaces the cruelty of all the characters, and the women’s cruelty (especially Portia and Jessica) left me surprised – it affected me more than I anticipated. Dramaturgs always ask, “Why this play? Why now?” And, honestly, I would never want to ban a play, but I am hard-pressed to come up with good answers for those questions right now. Q: What is your favorite line (or set of lines) from The Merchant of Venice? And his affections dark as Hades pit, Let no such man be trusted: listen to the music. The sly switch to a God as a woman, and the clarity of the irony of how Portia speaks of mercy and salvation – such Christian terms – it’s just gorgeous and makes me sad. Q: How did you feel about Play on! at the start, and now? Elise Thoron: As a theater maker who loves working with multiple languages on stage and poetry, the idea of robbing the ear of the sound of Shakespeare’s actual words, no matter how unintelligible, was alien. So I was very skeptical about the endeavor at first, but I knew I wanted to spend time with the Merchant of Venice and I love translating. Lue put it in a good way: this is an experiment, it may be a bad idea, or it may be a good one, but we’ll learn a lot in the doing. And that felt very true to me, so I signed on. Now after hearing the translation of Merchant and feeling it live with actors and audience, I see great benefits. So I am becoming a real Play on! convert. The alterations you have to do in order to make verse really land and have meaning to a contemporary audience are actually very small. I am excited to see where Play on! goes from here and eager to work more on the translation in context of a production. Julie Felise Dubiner: Yes – I am looking forward to what Elise and the other playwrights do with these plays next. This has been such a worthy experiment, and I didn’t have a whole lot of doubts about that listening to Lue as she designed the project and commissioned everyone – but I am super excited that so many of the artists I have spoken with want to take the next leap to stage the translations, or fully adapt the plays, or use the inspiration as a springboard for a wholly new piece of art. The cross-country and cross-century conversations have been fascinating.